Located in the heart of Peoria, our Life Together Center is a unique meeting, gathering, and community event center supporting both the life of our church and the community at large. The Center is a multi-room, multi-purpose facility that can host a variety of events and is a part of the church’s active outreach to the community. 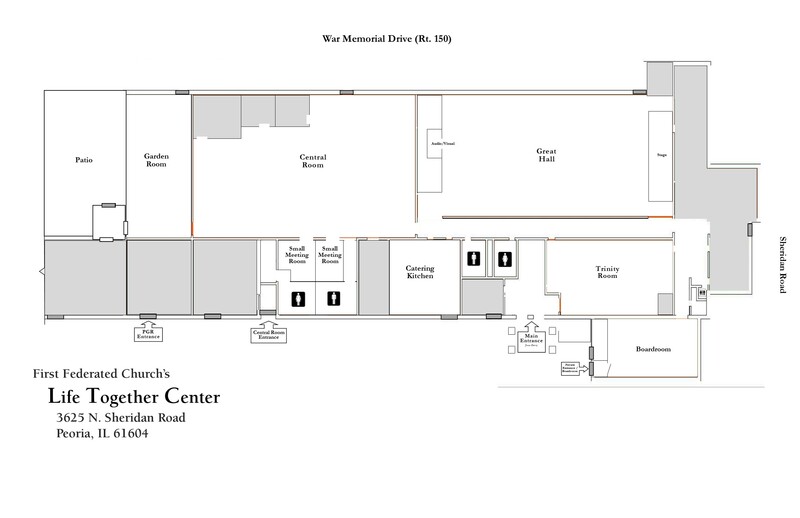 The Center has rooms to host both large and small events such as Christian Education offerings, celebrations, fundraisers, congregational meals, and committee meetings. A priority for this building is to support special mission opportunities with local nonprofit organizations for fundraising, meetings, etc. A special rate is offered to nonprofits. The Life Together Center can host a variety of sizes of groups for events such as wedding receptions and family gatherings with an adjacent catering kitchen available. Visit our Life Together Center Facebook Page! Room Request, FFC - First Federated Church main building rooms are available to church members for book or Bible studies, church gatherings, committee meeting, etc.